Tips If Your Child's Asking "What Sport Should I Play?" Children and sports seem to just go together for many kids and their families. While not all children will want to be active participants in a sport - preferring other activities instead - many will relish the opportunity to be involved in an athletic experience. Choosing a sport for your child is an important decision for any parent. Some children are more inclined to team sports while others will prefer individual sports. Some body types are better suited to some sports than others. And some children will be more interested in low impact sports while others will be anxious for a more physically demanding sports opportunity. So how can a father help his child pick a sport that will best serve the child's needs and interests? A child's interest in a given sport is the best determiner of whether he or she will enjoy it as a participant. So expose the child to a wide variety of sports experiences. Watching sports on television is a good introduction, but even better is to be a spectator in real life. Talk with them about what they like and dislike about each sport. As you check out the various sports, see if you can tell which of them seem most interesting to the child. Listen to your child for hints about their preferences. Maybe they will talk about the players, the strategies, or they will tell others about the experience. They may gravitate towards friends that play a particular sport. If you watch and listen, you can pick up some clues about the sports that interest them most. Some children will prefer to participate in a team sport like football, baseball or basketball in which they play a role on a team. Others will prefer being on a team where their own skills matter most. Sports like these include swimming, tennis or golf. Or they may simply enjoy individual sports like cycling and gymnastics. As you observe your child, try to find out what their preferences are. These observations will help you zero in on a sport that will work best for the child. A short and stocky child may be better suited to football than basketball. Tall and lanky may work better for basketball or track. While there are always shorter than average basketball players and smaller than average football players, odds of their success at a young age have a lot to do with their body style. Once you have narrowed down to a few sports that they seem to enjoy, try them. While you should avoid playing more than one sport during any season, it would be OK to have them play soccer in the spring, football in the fall and volleyball in the winter. As they begin to better identify with one sport, then you can drop some of the others if needed. 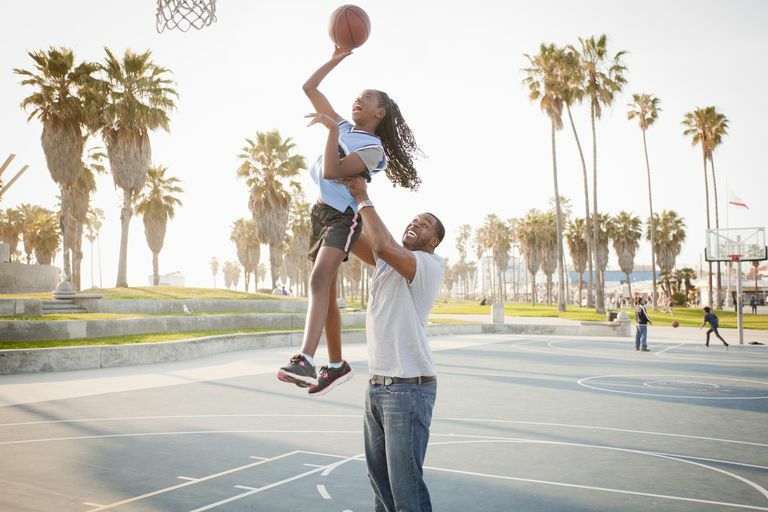 O ne of the best things a dad can do with a child learning a sport is to teach them fundamentals one on one. Many dads spend hours with their kids playing catch and having them field pop flies and grounders in the back yard. Other dads set up cones and practice dribbling a soccer ball in and out of the cones. It is quality time for you and for the child and helps them learn basic skills in a non-threatening environment. If their sport involves skills you don't have, try learning them together. Before participating in sports actively, make sure that the child has a physical exam. Discuss the sports plan with the doctor and talk about the physical demands of the sport. Too many times, children are injured in sports because they are not quite ready physically or they have a limitation that they didn't know about before. Participating in a sport requires responsibility and self-discipline for both the child and the parent. Practicing at home, keeping track of equipment, coming on time to practices and games, and being active all require a sacrifice of time and other interests. Sports can be a good teacher of personal responsibility. If your child is heavy or sedentary, start with small things. Getting a skateboard, a bicycle or a trampoline can be a good way to transition a more sedentary child away from books or video games and into a more active lifestyle. Consider some less popular sports. Organized sports can include things beyond the traditional football, softball, baseball, soccer, and basketball. You and your child might want to think about martial arts, cycling, volleyball, cross country, track and field, golf, fencing, lacrosse or ballroom dance. All of these count as sports and will help your child learn important skills. Don't try to project your own interests or your past on your child. Even if you were a star pitcher in your youth, that sport may not be for your child. Participating in sports is more important than which sport they choose. Pushing your child into a sport just because you excelled will usually backfire.